Erected between 1926 and 1929 for Singapore’s municipal administration, this building has played an important role in the country’s history. After occupying Singapore for three years, the Japanese signed their capitulation here on September 12, 1945. Singapore was still a colony in the British Empire when King George VI gave it the status of a city in 1951; on this occasion, the building’s name was changed from Municipal Building to City Hall. In 1959, Lee Kuan Yew, the first Prime Minister, announced in this building Singapore’s internal self-administration. In 1963, when Singapore achieved complete independence from the British and became a part of the Malay Federation, Lee read the corresponding proclamation here. After Singapore left the Malay Federation, the first government of the independent city-state was sworn in on August 9, 1965 in City Hall. 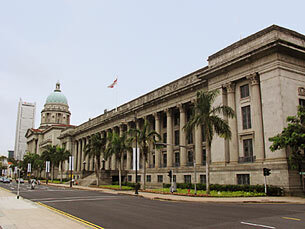 Until 2005, facilities of the municipal and national administration and of Singapore’s Supreme Court were located in the building. In 2006, it will be one of the main venues of the first Singapore Biennial; after that, remodeling will begin to turn it into a National Gallery, slated to open in 2010.